Cheap Cruises from Galveston - When and Where Can I Go? Cheap cruises from Galveston are available on all of the lines that serve the port and many of their varied itineraries. Galveston’s location makes it a gateway to Mexico and points in the Caribbean, with some lines even departing the port for transatlantic crossings to places like London and Barcelona. Royal Caribbean from Galveston has their 15 night jaunt across the Atlantic on sale for the April 21 sailing, where prices start at just $449 per person. This trip takes you to Nassau and ports in Portugal and Spain before the end port of Barcelona, combining the Bahamas and the Mediterranean into one vacation experience. Transatlantic cheap cruises from Galveston are also offered by Princess Cruise Lines whose jaunt starts at just $805 per person, a savings of 42%, for the April 13th sailing. The ports of call on this trip include Ft. Lauderdale in Florida, and ports in Portugal, Belgium and France before your end port of Southampton is reached. Looking to stay a bit closer to home? 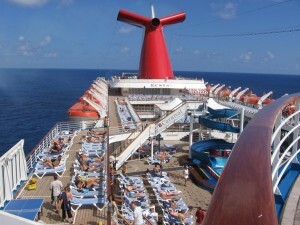 Not to worry, Carnival cruises from Galveston are also on sale, trips like their April 18th sailing for 4 nights to Cozumel that starts at just $429 per person, a savings of 52% off the regular fare, or their 7-night trip to Key West, Freeport and Nassau sailing April 14th that is on sale starting at $569 per person, saving you 66%. Carnival is also offering their 7 night outing starting on May 5th that visits Roatan, Belize and Cozumel, Mexico, starting at just $619 per person, a savings of 63%. Cheap cruises from Galveston are also offered by Disney Cruise lines, with their April 16th sailing to Cozumel, a 4-night cruise on sale for just $540 per person. If Jamaica has been calling, the Royal Caribbean offering for March 31st, one of the cruises departing from Galveston, TX is a 7-night trip that also visits Cozumel and Grand Cayman before heading to the port of Falmouth in Jamaica. This cruise is on sale starting at just $699 per person. For more sophisticated cruising, check out the all-inclusive cruises from Galveston like the Princess offering that departs on April 6th, 2013. All of the things that make Princess one of the best cruise lines in the world are included as you visit Roatan, Belize and Cozumel, all starting at just $605 per person. Cruisers that depart from Galveston have many choices when it comes to places to visit and cruise lines to choose. Cheap cruises from Galveston just add to the benefit as you can get away for less, from a port close to home.